British composer, arranger and conductor. 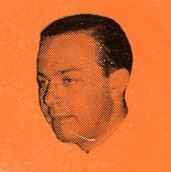 Cyril Ornadel rose to prominence in Britain during the 1950s, largely due to his weekly appearances conducting the orchestra for the popular television series “Sunday Night at the London Palladium”. He was MD for numerous top musicals in London’s West End, and his composing credits include the hit show “Pickwick” and the song Portrait of my Love which gave Matt Monro an international hit. His son is Guy Ornadel.